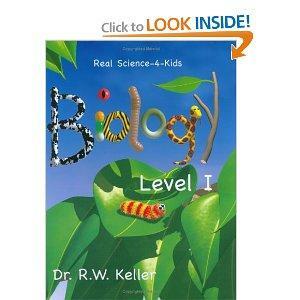 Real Science 4 Kids (RS4K) is a science curriculum that does not promote a particular world view. Whether you subscribe to Darwinism, Creationism, or Intelligent Design philosophies, you can use these materials to teach science from kindergarten through the ninth grade. This science curriculum is produced by a small publishing company, Gravitas Publications, Inc. It is taught on a three year schedule that is repeated over and over again the student masters the concepts. In the first year, students learn chemistry, followed by biology and then physics. This order is repeated for each grade level. Repetition is the key to mastery and helps children internalize concepts and make them their own. Each book contains ten lessons and ten labs with the suggestion that you do one lesson per week. The curriculum focuses on critical thinking skills which are imperative for success in all areas of life. The curriculum that is designed to be taught by the layman; the average mom or dad that is interested in giving their children a thorough, hands-on foundation in science. Dr. Rebecca Keller has a Ph.D. in biophysical chemistry. She has worked in the areas of molecular biology as well as neuroscience and biophysics. She homeschooled her three children for 14 years. It was during this time that she realized the need for textbooks that got kids excited about science and decided to create her own. She began to invite some of the neighbor children to participate in the labs and experiments she created for her children. These were an instant success, and in 2001 she began releasing her teaching materials to other homeschooling moms. Dr. Keller writes a blog for the users of RS4K at the Gravitas website. RS4K comes in three levels. Pre-Level One is for grades K through three. You can get each component individually or buy the three categories in a bundle with the teacher's guide, student textbooks, and lab sheets included. What are atoms and molecules? Level two is for grades seven through nine. At the time of this writing the textbook is still being written, but Gravitas Press is offering online classes with Dr. Keller. Included are a weekly online lecture, assignments, quizzes, and question and answer sessions. These two curriculums work together to create a strong foundation for scientific knowledge and literacy. RS4K costs about $300.00 for each level, plus the cost of the Kogs-4-Kids and the materials needed for lab experiments. Each level is used for three years and can be reused with younger siblings. This is a good science program for parents that might not feel confident in their ability to cover all the necessary information in the study of science.